It’s back…our most popular event of the year for the Ladies! 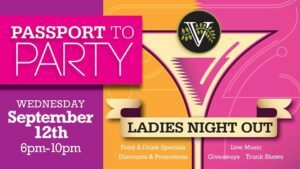 LADIES NIGHT OUT AT VICKERY VILLAGE! Wednesday, September 12: 6:00 p.m. to 10:00 p.m. Check in under the Clocktower when you arrive to receive your Passport and list of activities and specials for the evening!